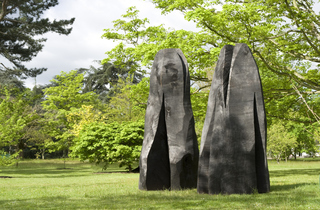 If, like me, your fingers are anything but green and you prefer inanimate objects to plant life, then the occasional outdoor exhibitions at Kew Gardens (Dale Chihuly in 2005, Henry Moore in 2007) represent the best moments to visit. 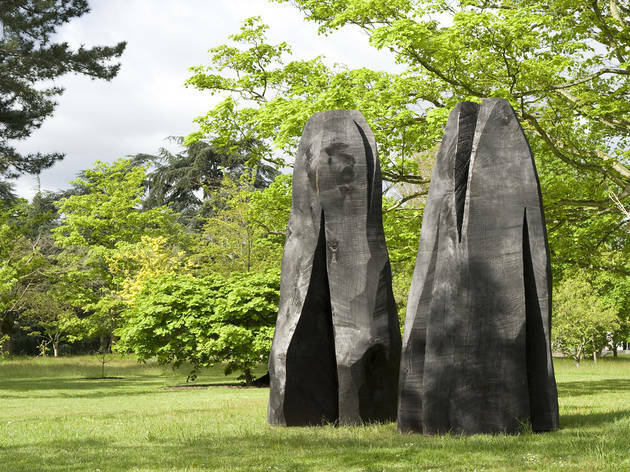 Of course, the chainsaw-wielding 66-year-old sculptor David Nash's work was very much alive until recently – indeed, the giant, rotted oak he is remodelling at a working wood quarry in the grounds of Kew still stands upright. The trunk is slowly being hacked away, revealing one of Nash's trademark totems, which typically resemble a compartmentalisation of the timber column into either stacked cups, wedged grooves or some prehistorically carved monumental motifs. Unlike previous incumbents, Nash has seeded his pieces throughout the gardens, filling the dedicated gallery spaces and even invading the Victorian greenhouses. In the tropical zone my glasses fogged over, making it hard to find the carrot-like 'Three Iron Humps' that were pleasingly sucking up the moisture of the surrounding flowerbed. The dozen or so sculptures in the Temperate House jostle with the palms and ferns, perhaps peering out like ancient Mayan temples in the case of the majestic 'Crack and Warp Column' or else hiding in plain sight, like the well-camouflaged, cleft ash work, 'Big Tongue'. Introducing such manmade distractions might seem an imposition to staunch Gardeners' Worldies, but Nash is only mirroring the founders of Kew by forcibly introducing his exotic, rare species into a falsely constructed 'natural' habitat. Horticultural concerns aside, Nash's forms soar rather than sneak up on you when placed out on the open glades and promenades. The commanding 'Black Sphere', a puzzle ball made from tessellated beams of charred wood, stands on a raised mound and, along with other similarly blackened forms, provides much-needed focal points, or notes of dissonance, on what might have been an otherwise repetitious journey from one lumpen log to another. Just when all this chainsaw-massacre brawn begins to bore, Nash's drawings and documentation for his projects further afield, displayed in the Botanical Gallery, show his real range and conceptual concerns. For the past 30 years, for example, Nash has grown, pruned and fletched (artificially bent through nicks in the branches) a ring of 22 trees so as to form an architectural 'dome'. He's also created perfect rings of bluebells and released his sculpted 'Wooden Boulder' into a river, in the hope it will roll, gather moss and generally be poetically returned to whence it came. Walking past 'Black Sphere', I could have sworn I saw a too-perfect semi-circle of mushrooms on the slope, which I assumed had been sown there. I wasn't seeing things (nor had I been eating any dodgy fungi) but on my second visit a week later they weren't there. Nash's greatest skill is in setting up this double take, making us look again for geometry in leaf formations and constantly refuting our quest to find order in chaos.